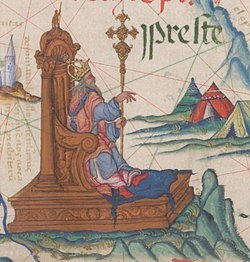 Prester John (Laitin: Presbyter Johannes) is a leegendar Christian patriarch an keeng popular in European chronicles an tradeetion frae the 12t throu the 17t centuries. He wis said tae rule ower a Nestorian (Kirk o the East) Christian naition lost amid the Muslims an paugans o the Orient, in that the Patriarch o the Saunt Thomas Christians residit. This page wis last eeditit on 28 Dizember 2017, at 04:43.